Not sure this is Paradise but, if it is, I wasn’t allowed in. Even, in desperation, venturing to mention my untarnished soul failed to gain me entry, the general feeling being that, if my soul really is in such pristine condition, I must have had it Photoshopped. The first picture of Paradise, of a rather more accepting and welcoming scene, can be found here . Technique: X-T2 with 55-200 Fujinon lens at 83mm (equiv); 800 ISO; Lightroom, using the Velvia/Vivid film simulation; Stanton Drew, near Bristol; 6 July 2018. That’s a thought – I certainly have to be kept from it >>> and now a Meat Loaf song fills my head – close your eyes – I’m singing …. Wonderful stuff! … the words .. not the singing … 😉 …. Is that ‘Bat out of Hell’?! Good idea … but better not …. I’m sure I’d go in and eat it … 😀 ….. Yes, I remember your initial foggy photo of this area. 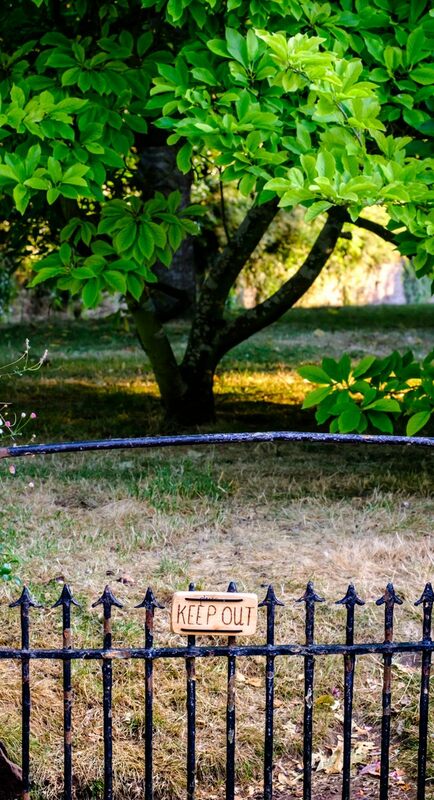 Keep out signs get my back up , but…what can you do…we have no right to roam in England. Cobblers… Good for repairing the soul. Just like cake when you’re on a diet, or shoes in a shop window after closing time… Most things seem better when you’re unable to have them. So don’t go through the gate, keep out at a respectable distance but look at the tree often, enjoy the view, and the grass in paradise will seem greener and greener. I struggle to keep my happy thoughts so I have to make or find as many as I can, as often as I can to stay sane (my brand of sane anyway) and if I can make someone else happy too, that’s twice the amount of happy thoughts for me.